Last summer, Lakewood Brewing Co. of Garland was one of a handful of local breweries invited to collaborate with iconic whiskey-maker, Jack Daniel's. Barrels for the initiative were hand-delivered to each brewery, with Lakewood using theirs to create a pair of special brews. Described as a refreshing take on a southern favorite, Jack’d Up Lemonale is a kettle-soured wheat beer brewed with a mix of Citra and Lemondrop hops. The beer was aged for six months in the aforementioned barrels, then enhanced with an infusion of 120 pounds of freshly-squeezed Meyer lemons. 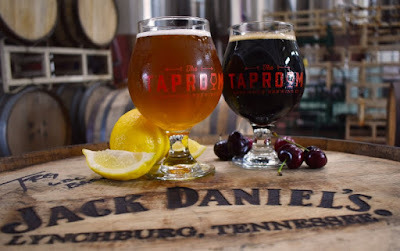 As for Tennessee Temptress, that beer is based off of Lakewood's popular imperial milk stout, The Temptress. Also aged for six months, this Temptress variety was refermented on over 500 pounds of sweet cherry puree. The added treatment is said to have provided a touch of sweetness, while also helping to round out the beer's edges. Both offerings are draft only and available now in the brewery's taproom, with deliveries to select accounts scheduled to begin next week. In addition, representatives from Jack Daniel's and Lakewood will be hosting a beer dinner at The Libertine Bar on Wednesday, June 27. The event will feature the two collaboration beers, as well as a selection of Jack Daniel’s top-shelf whiskeys.